Includes women with trauma exposure and/or PTSD symptoms before 1989 or with no trauma exposure and no PTSD symptoms through 2005 (n = 41 976). aCalculated as weight in kilograms divided by height in meters squared. Fitzmaurice GM, Laird NM, Ware JE. Applied Longitudinal Analysis. New York, NY: John Wiley & Sons; 2004. Importance Posttraumatic stress disorder (PTSD) indicates a chronic stress reaction in response to trauma. This prevalent condition has been identified as a possible risk factor for obesity. Whether PTSD symptoms alter the trajectory of weight gain or constitute a comorbid condition has not been established. Objective To determine whether women who develop PTSD symptoms are subsequently more likely to gain weight and become obese relative to trauma-exposed women who do not develop PTSD symptoms or women with no trauma exposure or PTSD symptoms and whether the effects are independent of depression. Design, Setting, and Participants The Nurses’ Health Study II, a prospective observational study initiated in 1989 with follow-up to 2005, using a PTSD screener to measure PTSD symptoms and time of onset. We included the subsample of the Nurses’ Health Study II (54 224 participants; ages 24-44 years in 1989) in whom trauma and PTSD symptoms were measured. Exposures Trauma and PTSD symptoms. Main Outcomes and Measures Development of overweight and obesity using body mass index (BMI) (calculated as weight in kilograms divided by height in meters squared) cut points 25.0 and 30.0, respectively; change in BMI during follow-up among women reporting PTSD symptom onset before 1989; and BMI trajectory before and after PTSD symptom onset among women who developed PTSD symptoms in 1989 or during follow-up. Results Among women with at least 4 PTSD symptoms before 1989 (cohort initiation), BMI increased more steeply (b = 0.09 [SE = 0.01]; P < .001) during the follow-up. Among women who developed PTSD symptoms in 1989 or later, BMI trajectory did not differ by PTSD status before PTSD onset. After PTSD symptom onset, women with at least 4 symptoms had a faster rise in BMI (b = 0.08 [SE = 0.02]; P < .001). The onset of at least 4 PTSD symptoms in 1989 or later was also associated with an increased risk of becoming overweight or obese (odds ratio, 1.36 [95% CI, 1.19-1.56]) among women with a normal BMI in 1989. Effects were maintained after adjusting for depression. Conclusions and Relevance Experience of PTSD symptoms is associated with an increased risk of becoming overweight or obese, and PTSD symptom onset alters BMI trajectories over time. The presence of PTSD symptoms should raise clinician concerns about physical health problems that may develop and prompt closer attention to weight status. Obesity is a significant public health problem in the developed world and is associated with an increased likelihood of premature mortality and higher rates of morbidity.1,2 Among women, the effects of obesity may be apparent at each stage of life (eg, affecting reproductive health and outcomes, aging, life expectancy) and may have far-reaching effects in future generations.3,4 Numerous studies have documented associations between obesity and various forms of psychological distress.5,6 Although some studies have failed to find a relationship,7,8 the preponderance of evidence suggests that severe forms of distress adversely influence weight status. 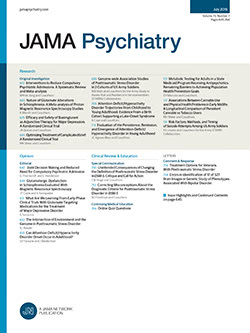 Recent work has identified posttraumatic stress disorder (PTSD), a marker of extreme distress occurring in response to a traumatic event and indicative of a chronic stress reaction,9 as a possible risk factor for weight gain and ultimately obesity.10-16 Posttraumatic stress disorder is prevalent especially among women; 1 in 9 women will meet criteria for the diagnosis during their lifetime.17 Understanding the role of PTSD is important for interventions aimed at curbing weight gain and obesity treatment. However, whether PTSD is causally related to weight gain and obesity or is simply a comorbid condition with shared risk factors has not been established. Most studies on PTSD and obesity are cross-sectional,14 and although they generally find positive associations, they cannot determine whether PTSD symptoms preceded development of obesity. In the only prospective study to date among young women who were not overweight when PTSD was assessed, those with PTSD were at increased risk of becoming obese during 6 years of follow-up.11 However, that study could not determine whether changes in PTSD status lead to changes in weight status over time. Demonstrating that PTSD symptom onset is associated with altered trajectory of weight gain would provide stronger evidence that PTSD is a risk factor for overweight and obesity. The present study sought to determine whether PTSD symptoms alter the trajectory of weight gain in a well-characterized sample of women. Using information on age at the onset of PTSD symptoms, we considered weight status as measured by body mass index (BMI) before and after the onset of symptoms and examined whether women who develop symptoms are subsequently more likely to gain weight and become overweight or obese. Because the debate on the relative role of trauma vs PTSD in pathophysiological processes is ongoing, we considered effects of PTSD symptoms separately from the effects of experiencing trauma and hypothesized that women who develop PTSD symptoms will gain more weight than women who experience trauma but do not develop symptoms. Depression and PTSD are commonly comorbid, and other work has suggested that depression is also associated with weight gain.18 To address concerns about potential confounding, we also considered the primary associations after taking account of depressive status. Additional potential confounders were selected based on prior work15 suggesting that demographic characteristics (eg, age and marital status) and behaviors (eg, cigarette smoking and alcohol consumption) may be related to PTSD and weight status. The Nurses’ Health Study II (NHS II) is an ongoing prospective cohort study of 116 671 female registered nurses that began in 1989. Participants are followed up via biennial questionnaires that gather information on health-related behaviors and medical events. For the present study, outcomes were assessed in 8 waves, with 83.7% of initially enrolled participants completing the 2005 questionnaire. The institutional review board at Brigham and Women’s Hospital reviewed and approved this study, and the participants provided written informed consent. We obtained data from a subsample of the NHS II who participated in a supplemental study in 2008 (only participants responding to the longer form of the most recent biennial questionnaire were asked to participate). The Trauma and PTSD Screening Questionnaire19 (also see Paula P. Schnurr, PhD; Melanie J. Vielhauer, PhD; Frank W. Weathers, PhD. Brief Trauma Interview. 1995 [available on request from Dr Schnurr]) was mailed to 60 804 participants. The response rate was 89.2% (n = 54 224). Analysis was limited to 50 504 of these respondents after excluding women who provided no information on trauma (n = 719) or PTSD symptoms (n = 2964) or at least 1 measure of BMI (n = 37). Differences between the included and excluded women were minimal with regard to baseline age, childhood socioeconomic position, and regional distribution. The proportion of non-Hispanic white respondents was greater in the analytic than in the original sample (95.7% vs 93.8%), and the proportion of current smokers was lower (11.4% vs 13.5%). These 50 504 women were divided into 2 separate groups for analysis depending on when trauma exposure/PTSD occurred. Analytic sample 1 included women who reported having PTSD symptoms before the start of the cohort in 1989 and women without PTSD or trauma through 2005 who had at least 2 measures of BMI during follow-up (n = 35 676); analytic sample 2 included only women who reported PTSD symptoms or worst trauma exposure on or after 1989 and through 2005 who had at least 2 BMI measures during follow-up (n = 14 828). Among women with trauma exposure or PTSD onset during the study follow-up (sample 2), assessments of BMI before and after trauma exposure or PTSD onset are available, facilitating direct evaluation of changes in BMI related to trauma and PTSD 20(Figure 1). A modified version of the Brief Trauma Questionnaire,21,22 included as part of the Trauma and PTSD Screening Questionnaire, was used to determine whether women met criterion A1 for traumatic exposure according to the DSM-IV PTSD diagnosis.19 The 7-item screening scale for DSM-IV PTSD of Breslau et al23 was used to identify PTSD symptoms among women who met criterion A1 for trauma exposure according to the Brief Trauma Questionnaire. Endorsing 4 or more symptoms in relation to the worst trauma exposure classifies PTSD cases with a sensitivity of 85%, specificity of 93%, positive predictive value of 68%, and negative predictive value of 98%.23 Participants were asked to identify their worst event on the Brief Trauma Questionnaire because this method is sensitive for screening PTSD.24 Women reported the age at which the worst event occurred and whether they experienced PTSD symptoms in relation to that trauma. They also reported the age they most recently had symptoms, from which remission status was determined for specific analyses. Women were categorized according to whether they had no trauma exposure, trauma exposure but no PTSD symptoms, trauma exposure with 1 to 3 PTSD symptoms (subclinical levels of PTSD), or trauma exposure with 4 or more PTSD symptoms (the validated diagnostic cutoff). Date of onset of trauma and/or PTSD was the age at which the worst event was reported. Data on weight and height were collected with the 1989 questionnaire, and weight was reported biennially. Self-reported weight was highly reliable (r = 0.97) among a subset of regionally residing participants who underwent direct measurement of their weight.25 We calculated BMI as weight in kilograms divided by height in meters squared. We used BMI cut points of 25.0 to define overweight and 30.0 to define obesity.26 Most participants had data on BMI at all follow-up periods (74.1%), with some women missing 1 (18.9%), 2 (5.1%), or 3 or more (1.9%) follow-up measurements. Trauma exposure and PTSD symptoms as a predictor of weight status were considered with several separate analyses. Initial analyses considered whether active or remitted PTSD symptoms vs no trauma or PTSD confer similar risk relative to the combined outcome of becoming overweight or obese in 1989, using the full sample (50 504 participants, excluding 214 without information on BMI in 1989). We used logistic regression models to compare women with no trauma exposure or PTSD symptoms with women who had current or remitted PTSD symptoms in 1989. In addition, using a subgroup from sample 2, we assessed the likelihood of being overweight/obese after experiencing trauma and/or PTSD symptoms, considering only women who experienced these outcomes as of 1989 or later and who reported normal weight on the questionnaire closest in time to when trauma occurred (n = 7116). Models were adjusted for demographics and other covariates using a commercially available statistical software program (PROC LOGISTIC in SAS, version 9.2; SAS Institute, Inc). To examine the timing of PTSD onset relative to weight gain, we conducted (1) hierarchical linear modeling using repeated-measures analysis (MPlus, version 5.1; Muthén & Muthén) among women with PTSD symptom onset before 1989 and (2) linear spline models to consider whether BMI rises more sharply after or before PTSD symptom onset among only women who experienced trauma in or after 1989. Hierarchical linear modeling analyses were conducted with sample 1, including women with trauma exposure and/or onset of PTSD symptoms before 1989 or women with no trauma exposure or symptoms. Women with no trauma exposure or PTSD symptoms were compared with women who had trauma exposure with no symptoms, 1 to 3 PTSD symptoms, or at least 4 PTSD symptoms whose onset was reported before 1989. The spline analysis was conducted with sample 2, women whose trauma exposure or onset of PTSD symptoms occurred during or after 1989. Those with trauma exposure and no PTSD symptoms served as the reference group compared with women with trauma and 1 to 3 or at least 4 symptoms and onset during or after 1989. Each analysis involved the following 3 sets of models: trauma exposure/PTSD symptoms only (model 1); model 1 plus age, race/ethnicity, region of residence at 15 years of age, and childhood socioeconomic position (model 2); and model 2 plus lifetime history of depression, marital status, alcohol consumption, and smoking status (model 3). Longitudinal multilevel models facilitated examination of how weight status changes over time within individuals and how that change is related to PTSD symptoms and their onset. Continuous BMI was modeled, and missing BMI values do not pose a problem.28 Intercepts of the outcome at the 8 evenly spaced points (2-year intervals) were fixed at 0. We estimated means and variances of the growth factors with maximum likelihood, and an unstructured covariance model was used. Table 1 summarizes the demographic characteristics of participants by PTSD symptom status, including samples 1 and 2. Through 2008, 18.6% of women experienced no trauma exposure or PTSD symptoms; 30.3%, trauma exposure but no PTSD symptoms; 30.6%, trauma exposure and 1 to 3 symptoms; and 20.5%, trauma exposure and 4 or more symptoms. Compared with participants without PTSD symptoms, those with symptoms were more likely to be living in the South or the West at 15 years of age and were less likely to be living in the Northeast, were slightly older, had parents slightly more educated, had higher baseline BMI, were more likely to report lifetime depression, and were more likely to smoke. After adjusting for demographics, we evaluated the likelihood among all women in samples 1 and 2 of being obese or overweight in 1989 with consideration of trauma exposure and PTSD status before 1989. Compared with women with no trauma exposure or PTSD symptoms, women with trauma exposure only (odds ratio, 0.99 [95% CI, 0.95-1.04]) and women with remitted symptoms (1.03 [0.96-1.09]) did not demonstrate excess odds of overweight or obesity. Women with trauma and ongoing symptoms had significantly excess odds (odds ratio, 1.15 [95% CI, 1.08-1.23] for 1-3 symptoms; 1.26 [1.18-1.35] for ≥4 symptoms). We then examined the odds of becoming overweight or obese among women with normal weight at baseline who experienced trauma exposure and/or PTSD symptoms in 1989 or during follow-up through 2005. Women had increased odds of becoming overweight or obese of 18% with 1 to 3 PTSD symptoms (odds ratio, 1.18 [95% CI, 1.04-1.33]) and 36% with at least 4 PTSD symptoms (1.36 [1.19-1.56]) in adjusted models compared with women with trauma exposure only. Results remained significant albeit slightly attenuated after adjusting for other covariates, including depression. Unadjusted BMI trajectories over time indicated a faster rate of weight gain among women who experienced trauma or PTSD symptoms before study entry relative to women who never experienced trauma or PTSD (Figure 2). At every follow-up year, women who initially reported trauma exposure and PTSD symptoms had higher BMI, even after controlling for all covariates, including depression (intercept parameters are given in Table 2). Furthermore, a dose-response relation was evident. Greater numbers of PTSD symptoms were associated with greater BMI increases over time (slope parameters are given in Table 2). We also compared the steepness of the BMI increase among women with trauma exposure, comparing women with and without PTSD symptoms. In fully adjusted models, compared with women with trauma exposure and no PTSD symptoms, women with 1 to 3 symptoms (b = 0.03 [SE = 0.01]; P < .001) and with at least 4 symptoms (0.06 [0.01]; P < .001) demonstrated faster rates of BMI increase during follow-up. By considering only women with PTSD symptom onset after entry into the study, we could evaluate whether PTSD symptoms alter BMI trajectories. Spline models that impose an inflection at the time of PTSD symptom onset indicated that BMI trajectory before symptom onset did not significantly differ from the trajectory in women with trauma exposure who never developed symptoms. However, after PTSD symptom onset, women with 1 to 3 symptoms (b = 0.05 [SE = 0.01]; P < .001) and with at least 4 symptoms had a faster rise in BMI (0.08 [0.02]; P < .001) over time compared with women with trauma exposure and no PTSD. This effect was maintained after adjusting for all covariates, including depression (Table 3). Symptoms of PTSD were associated with faster weight gain and increased risk of obesity in women. Moreover, to our knowledge, these findings are the first to demonstrate that PTSD symptom onset is associated with altered BMI trajectories over time. Relative to women who did not experience trauma or PTSD symptoms at any time, women with PTSD symptom onset before 1989 had higher BMI at every follow-up assessment, and their BMI increased at a faster rate. Among women whose trauma exposure occurred in 1989 or during follow-up, an altered BMI trajectory was evident. Before PTSD symptom onset, BMI trajectories were comparable to those of women who did not subsequently develop PTSD symptoms; however, after symptom onset, BMI increased at a faster rate. Previous studies have largely focused on the association of PTSD symptoms with weight status in combat veterans.13,14,29-33 This study is the first to examine the prospective relation of PTSD symptoms to BMI trajectories and obesity in women exposed to a wide range of traumatic events occurring in civilian settings. Rigorous epidemiologic studies increasingly show that PTSD has significant implications for physical health.34-36 Moreover, the effects of PTSD appear to result from more than comorbid depression, and even subclinical threshold PTSD levels should be considered as potentially increasing the risk of subsequent health problems. The link between PTSD and obesity is of particular interest given that PTSD has been identified as a potential risk factor for cardiometabolic diseases37-39 and that obesity is a candidate mechanism by which these effects occur. Posttraumatic stress disorder may influence weight gain by behavioral and biological mechanisms, and both mechanisms may operate simultaneously. Recent studies have suggested that PTSD is associated with physical inactivity,14 increased consumption of unhealthy foods and beverages,40 or generally dysregulated food intake related to dependence on activation of the brain reward system.41 In addition, dysregulated neuroendocrine function, including enhanced negative feedback sensitivity of the glucocorticoid receptors, blunted cortisol levels, and exaggerated catecholamine responses to trauma-related stimuli, has been found in adults diagnosed as having PTSD.39 Recent work has suggested that neuropeptide Y is a likely mediator between PTSD and metabolic imbalances owing to high levels of exposure to sympathetic activation.11 Animal studies suggest that stress upregulates neuropeptide Y, which plays an important role in adipose tissue remodeling and development of abdominal obesity.42 Thus, high levels of distress may directly alter production and distribution of fat. This investigation has numerous strengths, including prospective data, a large study population, extensive data on potential confounding factors, and information on BMI before and after the onset of PTSD symptoms. However, PTSD was assessed only in relation to the worst event, which can result in some misclassification of timing of the onset of PTSD. Trauma exposure, PTSD symptoms, and age at onset were assessed retrospectively, which can result in underestimating lifetime prevalence or psychopathology.43 In our sample, the prevalence of trauma exposure is comparable to that of other samples using DSM-IV diagnostic criteria,44 but the prevalence of women reporting at least 4 PTSD symptoms (20.5%) is somewhat higher,17 possibly because of our use of a screen rather than a diagnostic interview. Also, to limit concerns about potential confounding, we adjusted for lifetime depressive status; however, a more refined assessment of confounding was not possible because we lacked information on the timing of depression relative to PTSD symptom onset. Another limitation is generalizability, given our population of predominately white female nurses. Finally, confounding by some unmeasured variable could explain findings. However, this possibility seems less likely given that observed associations were unchanged in analyses that considered BMI before and after the onset of PTSD symptoms, whereby each woman served as her own comparison. Studies have suggested that obesity is difficult to treat once it develops.45 Thus, although PTSD is a significant concern for its effects on mental health, our findings also suggest that the presence of PTSD symptoms should raise clinician concerns about the potential development of physical health problems. Thus, primary care settings that treat populations at high risk for trauma exposure may want to screen for PTSD and monitor patients for other sequelae. Findings from this study suggest that trauma will be most strongly associated with increased risk of weight gain if trauma leads to the development of PTSD symptoms, although future work may also want to consider the type of trauma in this relationship more deeply. Physicians may be more effective if they can recognize and manage this type of emotional distress. Our work may also suggest that women with PTSD should be monitored or undergo screening for development of adverse cardiometabolic outcomes. In fact, our work highlights the importance of expanding PTSD treatments to attend to behavioral alterations—such as changes in diet or exercise—that lead to obesity. Health behaviors are completely outside the scope of PTSD treatments at present. Moreover, our data provide initial evidence that, if PTSD remits, adverse effects on weight gain may be attenuated. With improved prevention, the potential for earlier intervention, and more effective treatment strategies, we may significantly improve patient outcomes. Submitted for Publication: January 17, 2013; final revision received May 14, 2013; accepted June 24, 2013. Corresponding Author: Laura D. Kubzansky, PhD, Department of Society, Human Development, and Health, Harvard School of Public Health, 677 Huntington Ave, Boston, MA 02115 (lkubzans@hsph.harvard.edu). Published Online: November 20, 2013. doi:10.1001/jamapsychiatry.2013.2798. Author Contributions: Drs Kubzansky and Koenen had full access to all the data in the study and take responsibility for the integrity of the data and the accuracy of the data analysis. Study concept and design: Kubzansky, Roberts, Bluestone, Koenen. Analysis and interpretation of data: Kubzansky, Bordelois, Jun, Roberts, Cerda, Koenen. Drafting of the manuscript: Kubzansky, Jun, Roberts, Bluestone, Koenen. Critical revision of the manuscript for important intellectual content: Kubzansky, Bordelois, Roberts, Cerda, Bluestone, Koenen. Statistical analysis: Kubzansky, Bordelois, Jun, Roberts, Cerda, Koenen. Administrative, technical, and material support: Kubzansky, Bluestone, Koenen. Study supervision: Kubzansky, Cerda, Koenen. Funding/Support: This study was supported by grants MH078928 and MH093612 from the National Institutes of Health (Dr Koenen). The NHS II was supported in part by grant CA50385 from the National Institutes of Health. Additional Contributions: The participation of the NHS II respondents made this study possible. The Channing Division of Network Medicine, Department of Medicine, Brigham and Women’s Hospital and Harvard Medical School, managed the NHS II.